Don't think the 'Malcolm X' reference wasn't lost on me Director Jason Borque. A whirlpool forms in the Boston Harbor or somewhere, and it's so powerful that it lifts up the iconic Plymouth Rock. A few miles away, a couple of black dudes are playing basketball. Note that neither of these brothers seemed to have any kind of skills in regards to this game, but that's really neither here nor there... But seriously, that brother executed one of the worse crossovers I'd ever seen. Then, out of the blue, Plymouth Rock lands on one of these brothers. Now what is the social statement that 'Stonados' was making here? Is it a statement of defiance? Hell yeah Plymouth Rock landed on you. Deal with it! Or was it a conciliatory statement? We are sad that Plymouth Rock landed on you, and you have our undying apologies. Or maybe it was just a stupid scene in an almost worthless SyFy original movie calling itself 'Stonados'. Anyway, Global Warming is back it again, because if something goes wrong in a SyFy original, there's a good chance that Global Warming is involved, and it's caused a big whirpool in the city of Boston which is tossing exploding rocks all over the place. I haven't made it to Boston yet, but apparently the people in Boston really love their Bruins. The people in Boston rock Bruins gear like it's nobody's business. You'd think they might be sporting some Red Sox gear about now, and of course the Patriots should probably get just a little love, not to mention the Celtics on a good day, but in this reality is the Bruins or nothing. They even went to a University of Boston Football game sporting Bruins gear. Oh.. wait. This was actually shot in Canada by a Canadian, and those other sports don't actually exist to those folks up there. Regardless of all of that, this situation is just terrible and all of Boston is on the verge of being wiped off the planet earth. Being originally a native of the city of St. Louis and a fan of the Cardinals, this would not upset me. I miss the Curse of the Bambino, an absent curse which has cost me two World Series parades. The Curse reference actually got a head up in this movie. As you can see, 'focus' and 'Stonados' has become an issue for us here at the FCU. Back on point. This situation is terrible but high school science teacher Joe (Paul Johansson) and best friend and backup weekend weather man Chuck (Sebastian Spence) is on the job! Not to mention Joe's sister, Megan the Cop (Miranda Frigon) is also helping out. True, the city of Boston probably houses the largest concentration of high intelligence on the planet Earth, but when trouble strikes that requires serious brain power, it's always best to get a high school teacher and a weather man. Also on board is light house proprietor The Smoking Man (William B. Davis) who is looking at the storm with his eyes. He trusts his eyes. He don't trust no damn scientific radar which doesn't show anything. Then there's FOA chief Tara Laykin (Thea Gill). Don't call her Tara. Her name is Ms. Laykin! And she doesn't trust her eyes, only scientific radar which doesn't show anything. One second because we've gotten distracted yet again, this time by Ms Laykin's assistant. While this character, played by actress Aliyah O'Brien, serves almost no real purpose in the movie other than handing Ms. Laykin papers and reciting the obvious, her presence in this movie is most appreciated. The situation is dire as the typhoons are picking up and the exploding rocks are exploding harder. Also, Joe has a bratty teenaged daughter and a hysterical young son he's having to deal with. They've been kind of at odds since their mom died, but when the time comes to face down this killer storm, armed with some kind of super nuke type device, Joe takes his kids with him because family needs to stick together. That's what Joe said. 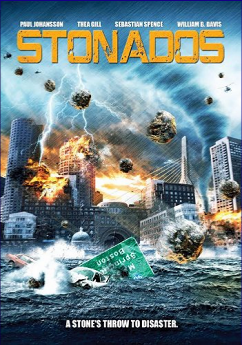 There's really not much to say about 'Stonados' as it is fairly typical, somewhat slow moving SyFy movie ridiculous slop featuring suspect special effects, but at least this one had a few things working for it to attempt to lift your mind off the slow moving ridiculousness of it all. For instance, there's Willam B. Davis' part in this movie where he interacted with absolutely nobody in this movie, except for a parakeet, and the parakeet left about halfway through. The budget probably didn't cover a wrangler for the parakeet for the whole day, but that's still some easy money for Mr. Davis right there. See a locked door with scared children behind it? If you're Megan hot the cop, you shoot at it. Joe, being the size of offensive guard probably could've just kicked it in, but I like Megan's approach better for no other reason because there was a chance that one of the bratty kids might catch a stray one. These movies would probably would be better if our heroes just used the 'Nuke Option' in the first scene just to get it over quicker. And don't miss Ms. Larkin's big 'Samuel L. Jackson - Deep Blue Sea' speech she gives. We must also give a nod to SyFy for pulling this movie as it was supposed air months ago, but then some loons decided to plant bombs at the Boston Marathon and a movie depicting things blowing up in some facsimile of Boston certainly would've been in poor taste. So with Plymouth Rocks falling on African Americans, irresponsible fathers risking their children's lives so they can chase killer storms as a family, typhoons carrying vibrating rocks that blow up, and professors at MIT and Harvard sitting this one out while high school teachers do all the heavy work, stones in tornadoes might not beat sharks in tornadoes… what could… but it still has its merits.  If you squint.